Discussion in 'Intermediate CJ-5 and CJ-6 Tech' started by Iandavidh, Nov 6, 2018. I used the existing threaded hole for hard top door hinges and the mounting bracket that came with the light. I can still fold the windshield down and the lights also clear with the hood open. I chose spot beam pattern and they work well on dark canyon and back roads as they light up the road more than double than headlights. I don't have a picture but I put them at the top of the windshield on my '74 CJ5. There were two holes on each side of the windshield frame. I just bought some angle iron and used the side holes to bolt it to. The other thing I had to do was just cut along the angle some with an angle grinder and then bent that piece so it was parallel to the ground when mounted. I drilled a hole in that piece and bolted the lights to it. Ran my wires up to them and I like the light output. I chose to put them up high since I drive on a lot of roads out in the country where it is pretty dark and there are deer out there. I also put two on the top of my winch/fairlead area and two fog lights on the bumper pointed to the side. I have attached a photo that show the lower lights but don't seem to have one of the uppers. I fabbed a bracket to mount a spot up on the door hinge location. The real question is "What do you want/need them for? If off-roading at night forget the headlight upgrades- headlights are designed for use *ON* the road & aren't suitable, no matter how bright a bulb, for off road trail riding which you'll want more of a flood pattern for. Due to the flood pattern putting them up on the windshield makes for a lot of light on your hood, best mounted down below the hood line. Daylighters look cool but were actually designed for off road racing- big powerful spots that reach out a long way ahead where you arn't concerned about blinding oncoming traffic. They work well mounted up high as the beam (mostly) shoots out straight over the hood. Hellion and dane71 like this. I think i would be able to mount them on the lower part so you can fold the windsheild. As for me....i dont think i will leave it there during summer. I just put them there so i can better see when i will plow the snow. What do you want them to do for you? The single best lights enhancement is replacement headlights. I like the H4 replacement bulbs from Hella or Cibie, but I'm an old guy and there are newer makers and types that may be better. You can put high-wattage bulbs in your headlights that can be very powerful, but won't pass state inspection. This. I use 80/100 watt, and no one has ever noticed them at inspection or any other time. High mounted lighting reflects backscatter from dust, rain, fog or snow. So to make the headlights better it would just involve changing out the bulb? And possibly the pigtails/sockets for ones that can resist higher temperatures. The one in my Harley has warped a little but still works. What are yours, Howard, make and model? That handle on the back is nifty too. I like the classic look and filament. If classically shaped but with modern internals (LED/HID, etc), then that's okay too. What are yours, Howard, make and model? It's an old Dietz I got off ebay, I just cruised there for a while there until I saw something that had the look I wanted. Sorry to be negative, but why do you want high-mounted lights? It's the Baja-racer look, and not practical IMO. They can only be used on the trail, and tend to blind you from the reflection off the hood and fenders. I dont find my mirror led spot to blind me with the hood reflection. 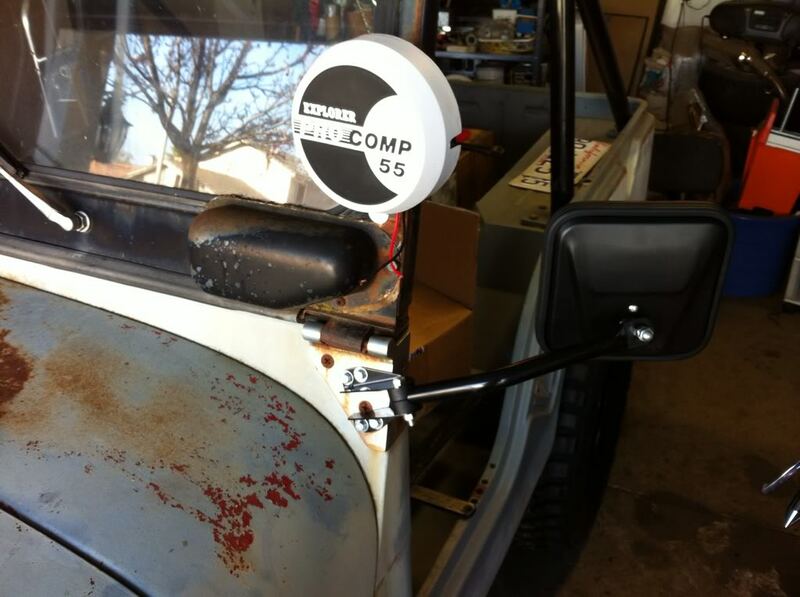 I had round KC's on the upper windshield corners at one time on my old jeep...easy enough to make brackets. That is until, like others, I discovered the hood glare made them useless. So I moved them to the front bumper. I have my current jeep set up the same way. Mine are the "driving lights" as opposed to the narrow beam spot lights. Simple, works well and I like the classic look. I use them all the time. I think they're 120w bulbs and its plenty bright. They're great. I think they're 120w bulbs and its plenty bright. They're great. Would love to see photos of them in use on a trail at night, just the KCs and/or in concert with your main beams. I ended up making my own tabs out of some steel and had my neighbor weld them to the windshield. I went with the driving light style. The lights are pretty bright and I dont have any problems with glare from the hood. I’ll try to get some pics tonight all of the ones i have right now are “too large”. You will get a lot if there is any dust, mist, or precipitation. I’m mostly in the desert so that’s not much of a problem for me.